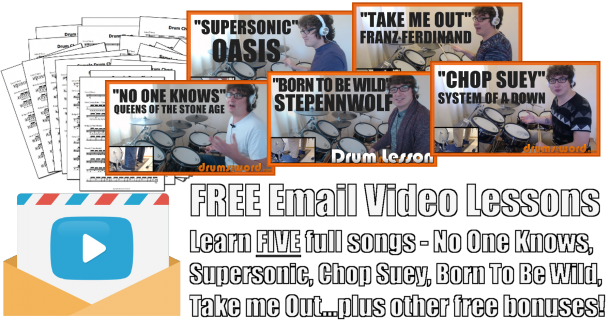 In this free drum lesson I’ll be showing you another extract from my eBook teaching the classic intro drum beat from the song “Take Five” by Dave Brubeck. The memorable and hooky melody of Take Five helped bring jazz to the masses in the late 50’s. It was all over US radio at a time when rock’n’roll was taking hold. This song features an extended drum solo, made even greater by the fact that it’s played in the time signature of 5/4! Joe Morello is criminally overlooked as a great drummer of this era but his economy and swing put him firmly on the map as one of the greatest Jazz players of all time! This is the very fist bar of the song. The whole tune is played in the time signature 5/4. This means that there are five counted beats to every bar. The same ride cymbal pattern is maintained during most of the tune and can be thought of as an extended version of the more traditional Jazz Ride Cymbal pattern. Extended by one extra beat. Look out for the rather tasty snare drum ghost notes on the second and third partial of the triplet in beat 4. These two snare drum notes slide into beat 1 in a really satisfying manner. Of course being Jazz, Joe changes this drum beat throughout the song. Joe improvises with the pattern, adding and subtracting notes to accompany the music. Sometimes only the snare drum on the ‘+’ of beat 2 is accented and sometimes no snare drums at all are accented. It’s worth mentioning that during live performance, Joe developed a stepped hi-hat pattern for the foot. In the early days he would step the hi-hat on beats 2 and 4 of the bar but in later performances added a note on beat 5 as well. A truly impressive technique to perform, especially when improvising over the top of it.